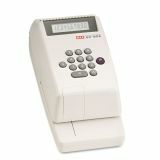 Max Electronic Checkwriter, 10-Digit, 4-3/8 x 9-1/8 x 3-3/4 - Check writer will print up to 10 digits, plus symbols on business and personal size checks. Embosses and prints one original plus two carbons. Embossed printing reduces risk of alteration. Embosses dollar and cent sign symbol before and after amount to provide additional protection against altering the amount of the check. Functions include printing, repeat printing and full input correction by clear key. 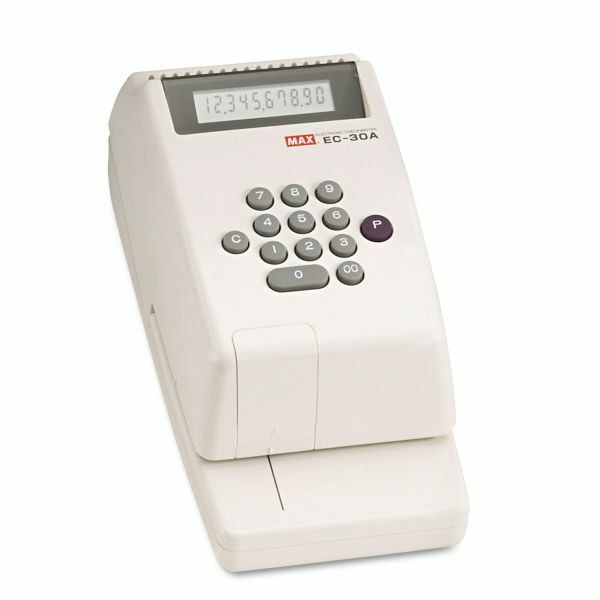 Check writer features an easy-to-read screen display and adjustable printing depth up to 1-7/8". Includes black ink roll. Weighs 2.87 lb.